Tagged by CNN as one of the twenty-five most powerful businesspeople in Asia, Liew Mun Leong, President and CEO of the Singapore-based real estate empire, CapitaLand, rose from very humble beginnings to become one of the world's wealthiest people. Since joining the company Liew has been communicating regularly and frankly with his staff in various ways, including emails. Like the previous two volumes in his internationally acclaimed Building People, Sunday Emails from a CEO, this compilation offers fascinating and instructive insights into Liew Mun Leong's inimitable character and his management philosophy. Liew Mun Leong is the Founding President and CEO of CapitaLand Group, which he helmed from November 2000 to 31 December 2012. Prior to that, he joined Pidemco Land as its President in 1996. Pidemco Land merged with DBS Land to form CapitaLand in November 2000. Mun Leong is currently Director of CapitaLand's philanthropic arm, CapitaLand Hope Foundation. He is also Chairman of Changi Airport Group (Singapore) Pte Ltd, Chairman of Surbana Consultants Holdings, as well as Director of Singapore Exchange Limited (listed on the SGX-ST) and Singapore China Foundation Ltd. In 2011, Mun Leong was conferred the Meritorious Service Medal at the Singapore National Day Awards 2011 for his chairmanship of the Changi Airport Group, in recognition of his outstanding contributions in public service and community work in Singapore. He was also named one of the top 25 most powerful businesspeople in Asia by Fortune magazine as well as Best CEO in Singapore by FinanceAsia that year. In 2008, Mun Leong was named Asia's Best Executive of 2008 (Singapore) by Asiamoney and Best CEO in Asia (Property) by Institutional Investor. He was conferred the CEO of the Year Award (for firms with a market value of S$500 million or more) at the Singapore Corporate Awards 2007 ceremony and in 2006, he was named Outstanding CEO of the Year during the Singapore Business Awards. In 2012, he was conferred the Outstanding PR Champion Award by the Institute of Public Relations of Singapore (IPRS). Mun Leong graduated from the University of Singapore with a Civil Engineering degree and is a registered professional civil engineer. 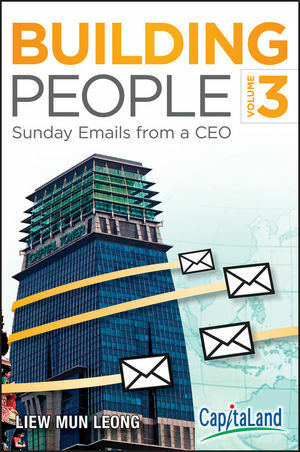 This book, available in English and Chinese, is the third volume of a compilation of Sunday emails to his colleagues. The first two volumes were translated into Chinese and Vietnamese.